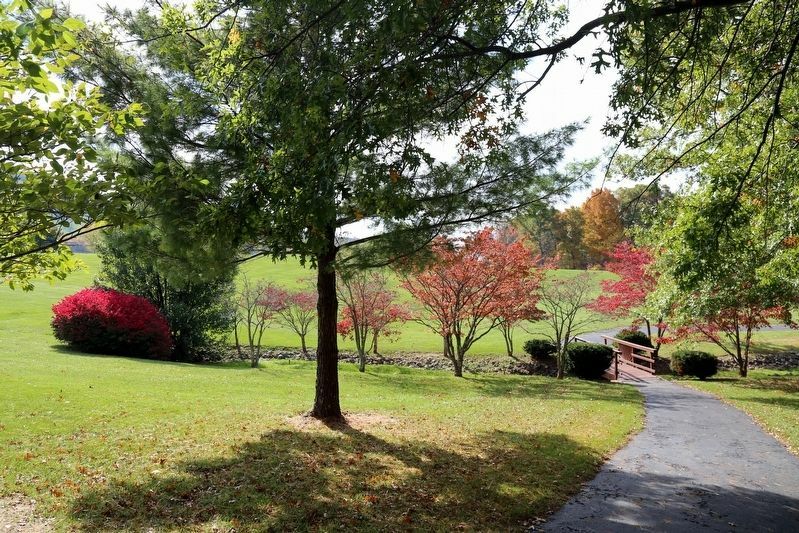 Before the park was developed in 1974, this valley was rich with farmland and timber. Seven farms worked the soil and grew corn, winter wheat and rye. Two of the farms raised dairy cows. The Raines family farm had approximately 189 acres and had several generations of their family in the dairy business. In the early years, the milk was bottled and delivered to customers nearby. When electricity was available in 1945, the dairy operation was automated and milk was delivered to the Queen City Dairy Company in Cumberland. Eventually, dairy trucks would pick up large tanks of milk. 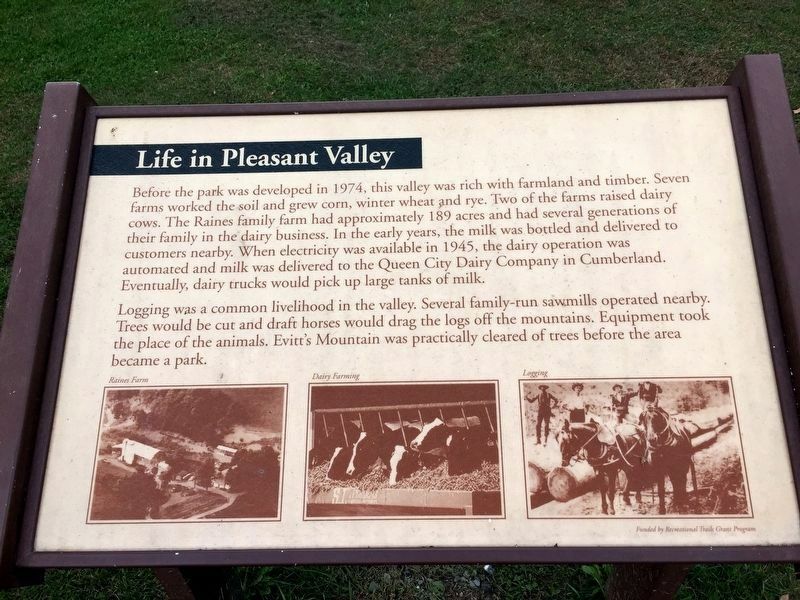 Logging was a common livelihood in the valley. Several family-run sawmills operated nearby. Trees would be cut and draft horses would drag the logs off the mountains. Equipment took the place of the animals. Evitt’s Mountain was practically cleared of trees before the area became a park. Erected by the Recreational Trails Grant Program funded this marker. , in Allegany County. Marker can be reached from Lake Shore Drive north of Exit 50 (Interstate 68). Touch for map. It is in the Rocky Gap State Park. Between Memorial Day and Labor Day there is a fee to enter the park. Marker is in this post office area: Flintstone MD 21530, United States of America. Touch for directions. Other nearby markers. At least 8 other markers are within 5 miles of this marker, measured as the crow flies. Martins Mountain (approx. 0.3 miles away); The Naming of the Lake (approx. 0.6 miles away); American Indian Rockshelter Trail (approx. 0.7 miles away); Evart's Homesite (approx. one mile away); Washington’s Road (approx. 3.3 miles away); Pennsylvania (approx. 3.6 miles away in Pennsylvania); Camp Mason & Dixon (approx. 3.9 miles away in Pennsylvania); Folck's Mill (approx. 4.3 miles away). Touch for a list and map of all markers in Flintstone. Regarding Life in Pleasant Valley. In the 1970s Rocky Gap Run was dammed to create Lake Habib and Rocky Gap State Park that surrounds it. 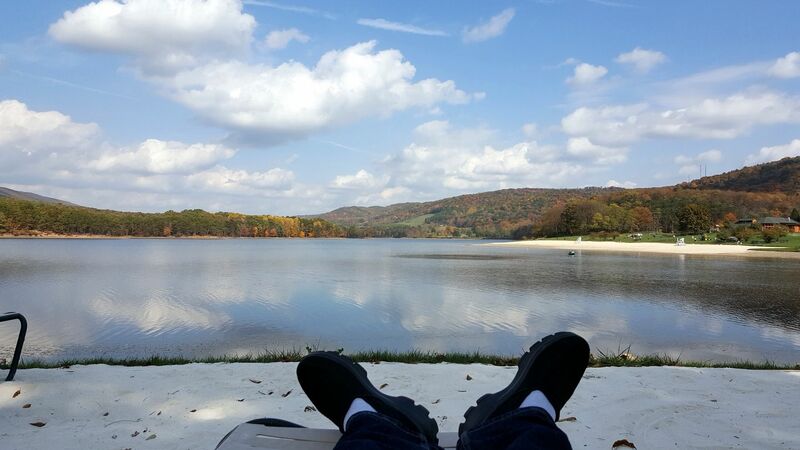 This view is from a lounge chair on the sand at the Rocky Gap Resort and Casino. The mountains in the distance are in Pennsylvania. 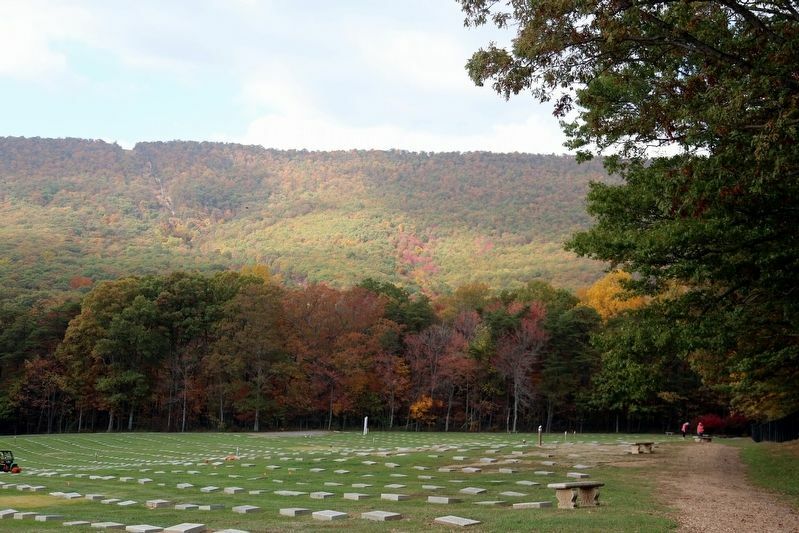 This cemetery, on Pleasant Valley Road, is operated by the Maryland Department of Veterans Affairs. More. Search the internet for Life in Pleasant Valley. Credits. This page was last revised on October 26, 2016. This page originally submitted on October 26, 2016, by J. J. Prats of Powell, Ohio. This page has been viewed 158 times since then and 8 times this year. Photos: 1, 2, 3, 4, 5. submitted on October 26, 2016, by J. J. Prats of Powell, Ohio.